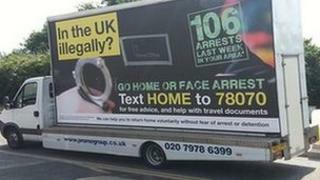 Billboards telling illegal immigrants to "go home or face arrest" are "nasty", says UKIP leader Nigel Farage. He told ITV's Daybreak programme the "Big Brother"-like one-week pilot in London would make no difference. The posters have also been criticised as "unpleasant" by Lib Dem MP, and former minister, Sarah Teather. The government says it is cheaper to get people to leave voluntarily and the campaign offers an alternative to being "led away in handcuffs". The pilot scheme sees billboards on vans being driven around six London boroughs chosen because of the number of illegal immigrants in them who have chosen to return to their home country voluntarily. Leaflets and posters will also be distributed in internet cafes, newsagents and money transfer shops, the government says, offering advice and help with travel documents. But the message has come in for some criticism. Speaking on Daybreak, Mr Farage - whose party campaigns for the UK's exit from the European Union and includes curbing immigration in its wider policies, said the campaign was really a reaction to his party's success in English local elections. "What the billboard should say is: Please don't vote UKIP, we are doing something. That's what it's all about. "I think the actual tone of the billboards, it really is Big Brother, nasty, it's unpleasant. I don't think using messaging like this makes any difference, what would make a difference is enforcing our borders properly." Former Children's Minister Ms Teather is MP for Brent Central, one of the boroughs targeted by the campaign. She told BBC London the "cost" would be community relations. "It's really unpleasant and we don't need it here," she said. "If the Home Office want to deal with problems, frankly they should be looking at themselves and their own practice." But the government says the pilot scheme specifically targets illegal immigrants and highlights the advantages for them of returning to their home country voluntarily. It also says it is much cheaper to get people to return home of their own accord rather than fight deportation through the courts. Speaking on Daybreak, Immigration Minister Mark Harper said there had been 15,000 "enforced removals" of illegal immigrants last year, compared with 25,000 people who left with "various degrees of voluntariness". He dismissed suggestions that the "go home" message could prove racially divisive. "This is about people who are here illegally, the messaging on the advertising is very clear," he said. "We are working very closely with a lot of community groups who actually welcome the opportunity for someone who is not here legally to leave the country in a dignified way rather than being arrested, detained and having an enforced removal." Mr Farage's party was once accused by the prime minister of being the home of "fruitcakes, loonies and closet racists" - although, in the wake of the May local elections, David Cameron said it was "no good insulting a political party that people have chosen to vote for". UKIP's electoral success heightened tensions between Conservative grass-roots and the leadership and prompted the party to draft a private bill to legislate for an in-out referendum on Europe by the end of 2017.